Losing a loved one in a sudden, unexpected accident can be one of the most painful emotional experiences a person can have. If that person was a main provider of important household considerations like income, upkeep, and parenting the burden can grow until it is literally too much to bear – especially if the decedent didn’t have life insurance. Additionally, if the accident was caused by a negligent or reckless driver on Florida roadways, there could be the stress of criminal proceedings to worry about. However, there is also hope for financial restitution if the accident is the fault of another. 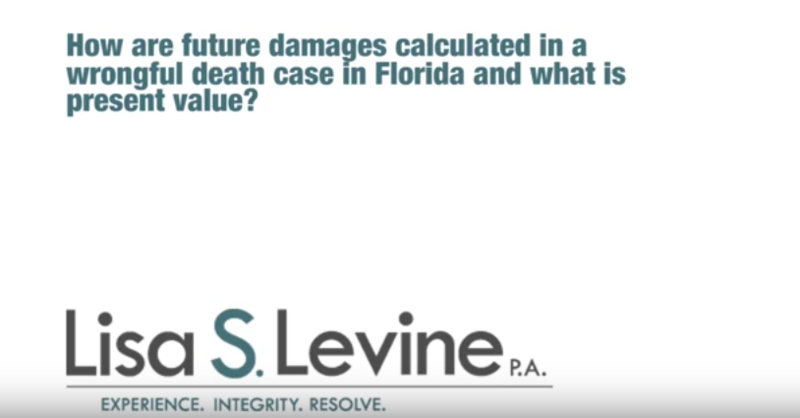 A Fort Lauderdale wrongful death attorney will be able to examine your case closely and construct a strategy to seek out the damages you and your family deserve. Lisa Levine has over 25 years of fighting for personal injury victims like you. Driven by a compassionate desire to help others, Lisa and her team at Lisa S. Levine P.A. will stop at nothing to pursue maximum compensation for your wrongful death case. It’s true that money can’t bring your loved one back, but if he or she died due to the negligent actions of a Florida driver in the counties of Broward, Palm Beach, Miami-Dade, or beyond, you deserve compensation to at least aid in the difficult transition you face. The personal injury lawyers at Lisa S. Levine P.A. will pursue that for you. We never charge you until you receive compensation, and your first consultation is free, so call us at Lisa S. Levine P.A. today to begin your road to justice and healing. Wrongful death and related definitions and actions are defined in the Florida Wrongful Death Act cited in Florida Statutes §768.16 – §768.26. This section of Florida code states that the legislative intent of the act is to shift responsibility of damages from the survivors to the wrongdoer or the wrongdoer’s estate. The wrongdoer is identified as any person or entity who, through wrongful act, negligence, default, breach of contract, or breach of warranty causes the death of any person – and that person, had death not occurred, would otherwise be eligible to pursue damages against the liable party/wrongdoer. 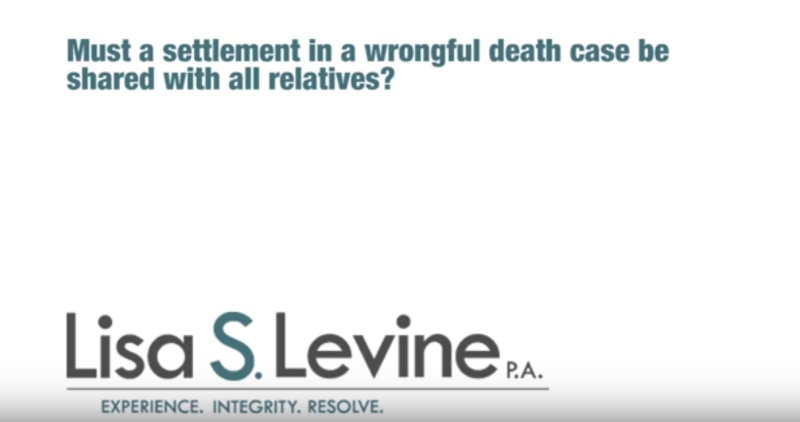 If the victim of wrongful death dies after bringing a personal injury suit against the other party, that suit shall be dropped in favor of the wrongful death suit pursued by the individual’s estate and survivors. Damages will then be dependent on eligibility with regards to causation and the relationship of any survivor to the decedent. If you have lost a loved one in an automobile accident caused by another driver’s negligent actions, a Broward County personal injury attorney will be able to guide you through the various definitions and processes accounted for in the Florida Wrongful Death Act. Usually, survivorship status and associated recoverable damages are determined on a case-by-case basis. A qualified Fort Lauderdale wrongful death attorney will be able to sort through the details of your case and guide your suit with appropriate strategies. Though the recoverable damages will vary according to the relationship of the survivor to the wrongful death victim, all potential beneficiaries must be listed in one suit against the wrongdoer or the wrongdoer’s estate and brought to court by the victim’s personal representative. The court will then decide what damages the victim’s estate and each survivor will attain; if a survivor at any time decides to accept a settlement against the wishes of the other survivors, the court must approve the settlement. Some damages recovered by the estate may be immediately liable to creditors for expenses created by the victim and/or the accident. An experienced and compassionate Broward County motor vehicle accident attorney will be able to help guide you through the extensive process of determining and pursuing damages. If you are dealing with the painful experience of losing a loved one to an auto accident caused by a reckless or negligent driver, your emotional burdens are enough. You shouldn’t also have to deal with the devastation this could also cause your quality and way of life. The skilled and caring wrongful death attorneys at Lisa S. Levine P.A. serve Fort Lauderdale, Weston, Miramar, Pembroke Pines, Hollywood, Tamarac, and Coral Springs and will fight pursue maximum compensation in your personal injury case. To schedule your free and honest initial compensation, contact us today at 954-256-1820.